If you have tested IE8 beta you might have already know what is activities and webslices. Those are the most interesting features of the IE8, if these features interests you, you can get the same functionality in Firefox too with cool new add-ons released by Firefox developers. Activities are contextual services to access web services at the click of a mouse button. Michael Kaply released a Firefox Extension to add Activities functionality to Firefox. 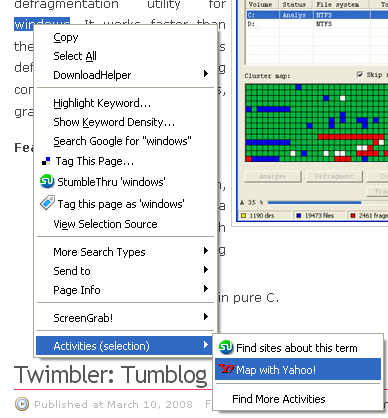 Install the extension and restart the Firefox, now right click your mouse and select Activities, you won’t find any Activities here, you can click “Find More Activities” that will lead you to Microsoft Activity providers page, where you can add activity providers to your contextual menu. To add any activity provide just click on the name and it will be added. Daniel Glazman released Webchunks add-on similar to the functionality of Webslices. Webslices allows users add web services like weather updates etc to browser toolbar so they get auto updated without visiting that site. It only works with FF3, so i haven’t tested it yet. Well I definitely wont be downloading IE8 as I am a converted Firefox man. To prevent any of my IE mates from getting the upper hand I will be downloading this plug-in to check it out. Will update you. Thanks for the heads up. I like more how the web slices idea is implemented in the Firefox browser. â€œPageSlices for Firefoxâ€ add-on allows to create web slice from any part of any web page.